Watch the video below to see how simple it is to operate. Quick, self piercing single action. Designed to reduce the amount of force required to cut and set. Does NOT need to be fixed in position to operate. Supplied with full operating instructions. Hand operated eyelet press capable of setting eyelets with an internal hole size of up to 16mm diameter. The HP450 utilises self-piercing eyelets so your hole is cut and set in one operation saving time and money this is ideal for for vinyl banners and will work through multiple layers of material with ease. Lightweight and portable: take the machine to the job rather than the job to the machine. Setting dies can be quickly changed to fit different sized eyelets, these high quality CNC produced dies are made from durable stainless steel to ensure long lasting service. The HP450 can also be used to set rivets, press studs, pop fasteners when used with the correct dies. Use with our very own range of British made Hanolex ™ banner eyelets, made from top quality solid brass – not plated steel – so they will never rust and ruin your banner. 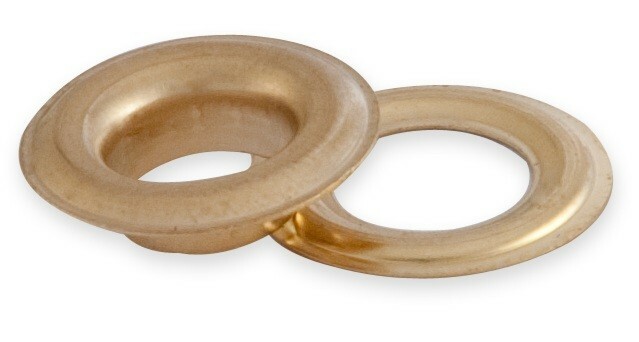 Eyelets are available in Brass, Nickel and Black colours, with hole sizes in 5mm, 9mm, 11mm & 16mm.